Have a beer with Conan O'Brien or Nelly? That's it. Just Shut Up. I'm a big fan of Trump's Apprentice. It's one of those great yell at the TV screen shows. There are also some key business lessons that can be learned. I know, it's not really a job interview; it's entertainment. But there is plenty of value in there. The most important and compelling lesson from this show so far, is the importance of knowing when to say nothing. Many of the people who get fired in boardroom are fired not only because of what they did, but what they said attempting to defend themselves. Okay. Summer was on the borderline of being fired. Then Trump starts going after the project manager and seems about to fire him. What does Summer do? She interrupts Trump to defend the guy who is about to be fired. This is the guy who tried to organize everyone else to go after her. This is the guy who's management style she disagreed with. This is the guy whom she predicted had led their team to failure before knowing the results. This is the guy who is about to be fired instead of her. And she interrupts Trump. Trump then turns to her to suggest she should be quiet. She keeps talking and interrupting. She finally talked her way into being fired. Last season, Rebecca seemed to have mastered that lesson. She spoke up only when absolutely necessary in the boardroom. When Trump went after someone, she generally let him go, unless Trump asked her opinion. When two people went after one another, she stayed out of it. As a result she made it all the way to the final two. Of course the classic example of talking your way out of the show is Bradford who in Season two was given an exemption, and in the heat of the boardroom exchanges, waived it. That stupidity got him fired. Of course, staying quiet is harder than it might seem. It's a lesson I keep trying to remember. Generally, I learn a lot more when I remain quiet and listen to others. I find I'm most likely to get in trouble in various aspects of life by speaking too much, rather than too little. It's all about tying to keep my ego on a tight leash, and why most of the entries in this blog end up several paragraphs shorter when I publish them than when I write them. This ties back to one of my earlier posts about writing. A key element of good writing is editing or cutting material. A key element for success in business is know when to stay quiet and not say anything. Tonight, however, I'm watching Titanic's Final Moments: Missing Pieces. I'm captivated. It's another documentary, this time focusing on an August 2005 dive made to Titanic, using new submersibles. 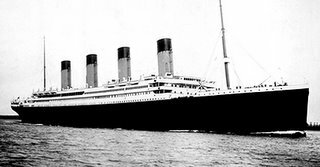 They are investigating a theory that not only did Titanic suffer starboard hull damage from the iceberg, but what really doomed the ship was grounding damage. Perhaps Titanic ran over the iceberg, in addition to running into it. That damaged the bottom of the ship's double hull and contributed to the sinking. It could also potentially explain why the stern split from the bow, took heavier damage than the bow, and ended up 800 meters away form the bow at the bottom of the north Atlantic facing the wrong way. And why there's a trail of coal more than a mile long leading from the wreck. When Robert Ballard's expedition initially found the ship in 1985, I was impressed, but pictures was grainy, and it took a lot of effort to really see what was in them. I had always been interested in the sinking since it coincided with my birthday, as did an number of other unfortunate world events (like the death of Lincoln). And I wanted to see more. Twenty years have lead to significant improvements in underwater photography and lighting. The images the History Channel is broadcasting are colorful, detailed, and eerie in way the previous images weren't. If you've followed the news about Play Cole, you may already know that Jon and Andrew have been successfully doing stand up for two months now. A video of one of Andrew's appearances is on his website at www.andrewtorresny.com . It's some funny stuff. Check it out when you can. MacSurfer picked up yesterday's post where I predicted Apple will license the Mac OS to other hardware vendors as a way out of the hardware business, and focus more on the content and software business. More than 400 hundred people visited over the next 10 hours. This will be a slight change of pace. 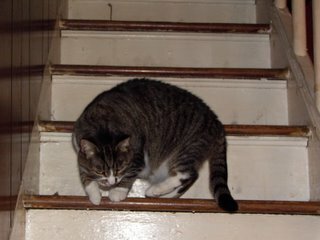 I have two cats I am trying to find homes for. Chase is the white cat. He is the friendliest cat I've ever met. He immediately gets know strangers and seeks out affection. Sit down in the same room and he will come right up next to you. Layla is the other cat. She is also friendly, but in a more traditional cat-like manor. She gets along well with people without always being underfoot. The cats have been been holding down the fort in an unoccupied house for nearly a year. Prior to that, they shared the house with a dog, a bird, some other pets and a human. It's a long story. Amazingly, despite being on their own most fo the time, they have maintained strict litter box discipline. 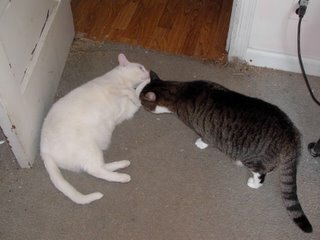 The house, however, is being sold, and we need to find a new home for these two wonderful cats. I considered taking one myself, but my apartment, combined with my heavy travel schedule is not a pet friendly environment. Plus, it didn't seem fair to subject the cat to the cross country airplane flight. I would like to find a home for one or both of these pets before we have to take them to shelter. If you, or someone you know would like to provide a good home for these cats, please contact me. 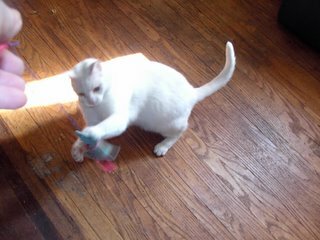 The white cat, Chase, has green eyes and a pink nose. He is very affectionate and not afraid of strangers. Layla, the other cat is not as affectionate, but still very friendly, and also is not afraid of strangers. They are not skittish. They were raised in a house with dogs and have been together for almost two years. They have both been neutered and had shots, but I have no records on that. They are between two and three years of age. I cannot say whether or not they are good with children, as I don't think they were ever exposed to them. They get along with each other very well, mutually washing each other and sleeping together. I don't want this to sound like an NPR fund raiser, but if you can help, please let me know. I general, I find myself agreeing with John Dvorak, the maverick pundit at PC Magazine. This time, however, he's wrong. In a recent column, he outlined the theory that Apple was going to migrate from OS X to Microsoft Windows. He has it backwards, however. My prediction is that Apple will eventually get out of the Mac hardware business, or at the very least, revisit the practice of licensing the Mac OS to other hardware vendors. Before I go any further, let me say I am not interested in taking sides in the Windows versus Mac holy wars that seem to inevitably erupt in any of these discussions. There is value in both platforms, and problems with both. Today, I am more interested in the various business models, rather than any question of technical superiority. To begin with, Apple products have a great reputation for simply working together. Whether that reputation is deserved or not is beside the point. Apple tightly controls their compatibility requirements, tightly controls their software requirements, and by making their own desktops, knows exactly which pieces of hardware need to work. Microsoft has done an incredible job of making Windows work on hundreds of thousands of different hardware configurations from vendors around the world that they cannot control. People may snicker, but I can walk into nearly any computer store and know that 90% or more of the products are likely to work with my Windows machine, whereas if I walk into an auto parts store, a significantly smaller percentage of components will work in my Subaru. The broad compatibility in the computer industry is amazing. Last year, Apple announced it was going to launch computers based on the popular Intel architecture, and at Macworld 2006 in January, they actually announced their first machines based on the new Intel Core Duo platform, the latest iteration of Centrino Mobile Technology. To back up for a moment, we now have Apple running its OS on the same Intel platform that Windows runs on. Apple developed a utility called Rosetta to allow older PowerPC (previous Apple CPU Architecture) applications to run on the new x86 Intel architecture. When Apple introduced OS X several years ago, they made a key change. They based the core parts of the OS on Unix. At that point they had the key elements in the OS to support running it on multiple platforms. So now, the OS can run on the Intel Platform. Most of the applications can run on the Intel platform. New hardware is based on the Intel platform. Here's where Dvorak and I begin to disagree. He takes the stand that Apples is a hardware company with a great user interface. He suggests they will abandon their core software and just maintain the interface running on top of Windows. line and put Apple on the fast track to real growth. First of all, I don't see Microsoft licensing Windows to Apple if Apple is going to hide the Windows interface with its own. Apple would probably have to go to the Department of Justice and claim antitrust issues, and it would take years to work its way through the courts. Second, I don't see Steve Jobs "caving" into Microsoft after all these years and essentially saying that Apple isn't as good as Windows. Even though Apple no longer runs the "switch" ads on TV, they still maintain that messaging on their website. Whether abandoning the Unix core of the Mac OS it right or wrong from a technological point of view, I don't see it happening because of the egos involved. Apple has always said it was a hardware company, not a software company. Historically that may be true, but some interesting things have happened. First I think it's a tad myopic to look at the iPod business as primarily a way to get Windows users to switch to Apple hardware. iPod hardware is successful in its own right, but the real money isn't in the hardware. It's in iTunes. And it's in the video content that Apple is now selling. Content is nothing but ones and zeroes. After setting up the infrastructure, there are very few costs associated with selling this content. Sure, there are the royalties that get paid, but those costs are only incurred when there is a sale. The true profit in the iPod business will come from selling digital content today and in the future. It's the same strategy Microsoft employs with the XBox 360, or Sony employs with the Playstation. It's not about selling the console. It's about selling the software and the content. Going back even further, is the strategy Gillette employed in the 1800s to sell razors. Sell the razor cheap so you can sell blades down the road. Afterall, that's where the real money it. Thus, my prediction (finally). Apple will release its OS to other manufacturers. One day we will see and HP, Sony, or Dell computers running OS X. If the Apple OS works on the PC (Intel) platform, and the Apple applications work on the Intel platform, then why should Apple maintain it's own hardware platform? Dvorak claims Apple can surpass its 5% market share and compete with Dell, HP, and others and produce high margin Windows machines. That doesn't make sense to me. There are very few high margin Windows machines, and that market isn't getting bigger. Average selling prices have been dropping for years. Margins have been getting tighter. That isn't going change just because you can get a piece of Apple hardware with Windows in it. Here's a secret most people may not realize about computer hardware. Computers and computer components in stores, warehouses, and shipping containers are like rotting vegetables sitting in the supermarket. Every day they are worth less. If a computer maker or retailer doesn't sell it today, they get less money when they sell it tomorrow. If you don't build or order enough units, you lose a lot of opportunities. You can't simply order more of the same thing because product development cycles are too tight. They will arrive too late. The bigger problem is when you overestimate demand, however. You build too many of a machine and it doesn't sell fast enough. Now you have to drop the price. But you still have to pay for your components. If you build too many, you are in big trouble, and can lose a ton of money. The most successful PC companies have developed expertise in managing demand and inventory, and that is a very tough business. So far, Apple has been fairly immune to that. If they underestimate demand on a product, they can adjust their own release calendars until the hardware sells. They really aren't competing with other PC makers. Why would Apple want to focus primarily on the hardware business? Becoming solely a software company can be a much more lucrative opportunity. If you release your OS to vendors, all you are physically sending them is a few DVDs. If you underestimate demand, you don't have shortages. You can sell an infinite number of licenses, which, really, are just permission to use the software. If you overestimate demand, you don't have millions of dollars in sunken hardware costs and unsold pallets of machines sitting on shelves. Apple's expertise in in software and interface design. It's in making it easier for people to use their machines without thinking about how they work. By licensing the OS they can focus on this and free themselves from the hassle of managing physical equipment. Apple can then limit their hardware sales to selling other vendors' computers through the Apple stores around the country. They already sell other vendors' hard drives, digital cameras, scanners, printers, and iPod accessories. Other manufacturers' computers and notebooks are just a small step. Further, consider the other users that you know. Are people more likely to buy a Mac Powerbook that runs Windows XP, or are they more likely to buy a Sony notebook that runs Mac OS X? The future for Apple is clear. Sell more ones and zeroes. Sell less physical stuff. Develop new software and interfaces. Let someone else deal with the challenges of hardware. Then you will see Mac OS market share grow. The WA state legislature has too much time on their hands. And rather than just making silly speeches, they are using the state budget to play practical jokes on one another. Fraser and other senators, whose country-club voice votes echo softly in their quiet chamber, have taken sarcastic offense to the House's raucous voting style. So, in jest, Fraser appropriated an $850,000 study to acoustically insulate the House chamber to stop the bell from "disturbing the decorum of the Senate." 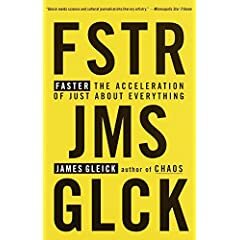 I just started this book about how the pace of change in the modern era. It covers topics such as increasing responsibilities and tasks that people have in their lives. It frequently returns to a discussion of the official US clock, maintained by the Navy. There are also frequent discussions of the futility of pressing the Close Door button on an elevator. When I started it last night, I checked the copyright. Apparently I bought it in 1999. It's been in one or more of my suitcases for nearly a year, but I haven't had time to get to yet. I'll let you know how it turns out when I get the chance to finish it and prepare a more indepth book report. I think the gardener did it. You know, I miss Eddie the Eagle. He was the British Ski Jumper, who, well, couldn't really Ski Jump. It was more like he Ski Fell. He had no chance of medalling, but competed anyway. He was a great example of someone participating in the sport for the sake of the sport. Apparently, the IOC did not feel that was enough to justify a performance, and began requiring that most performers actually be good or qualified. I can't blame them really. It is supposed to be the best of the best, and if I could participate that would really sully it a bit. Still, who doesn't want to cheer for the underdog. Today, I am pleased to announce the launch of the much anticipated Play Cole home page. Visit http://www.playcole.com to see videos, catch up on the latest Play Cole news, and learn more about these four brilliant comedians. The feature video for the launch is Planet of the Apes: Behind the Grunts. This is the online premiere of the Play Cole classic. After you watch the video, follow the link to YouTube.com, where you can rate the video, and suggest they feature it on their main page. My girlfriend and I were sitting in Starbucks today when she noticed a man walk by the window carrying 2 dozen eggs. While I doubt I would get an answer, I wanted to ask him, "Why are you carrying 2 dozen eggs?" A1: Because they're too young to walk. A2: Because I would look silly juggling them down the street. A3: I'd roll them, but this isn't the Whitehouse Lawn. A4: Have you ever tried pulling them? A5: Because I couldn't carry three dozen. A6: I lost a bet. A7: I won a bet. 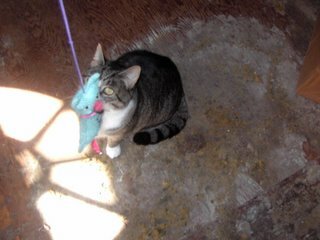 A8: I accidentally killed the chicken. A9: You should see the other guy. A11: I always wanted to be named Benedict. A12: I'm part of a support group for those who haven't come out of their shell. A13: Because you're not supposed to put them all in one basket. A14: My pockets are full of bacon. A15: Because if I didn't, that would mean the terrorists have won. I caught a 7:45 AM flight from IAD (Dulles airport outside of Washington, DC) to Seattle this morning. With the time zones, we landed in Seattle at about 10:30. These past few days, Seattle has been having one of those rare sun bursts for February. When the clouds go away, so does the heat, so it's a nice, chilly 40 degrees. Actually, that was the temperature in my apartment, but that's what sweaters and blankets are for. With the clouds gone, and the sun shining through, the view of the city and mountains is brilliant. The colors and textures of the mountains and landscape pop on days like this. One of the best things about flying into Seattle, is that about 2/3 of the time the planes land from the north and fly in over the city. They often come in either from over the sound to the west, or over the lakes to the east. Then they turn south and fly straight down I-5 and over downtown. The planes are low enough at the point that passengers have amazing views of downtown. You can pick out Greenlake, the Ballard Bridge, the Aurora Bridge, Paul Allen's Experience Music project, and the Convention Center. Today, I could even pick out my aprtment building from the plane. No one was in the hot tub. From the plane it looks like you could roll down the window and touch the Space Needle, the Smith Tower, and Columbia tower. During a game, you can see the crowds in Qwest Field or Safeco field, before continuing over the port. As you continue to descend, you may fly over a King5 helicopter landing at Boeing field, it's logo colors, brilliant against the morning light. The final couple thousand feed get kind of dull. And then you're at the airport wondering what people hope to gain by unhooking their seatbelt and getting up 10 seconds before the light goes off. Flying back into Seattle is the most consistently amazing approach I've seen from an aircraft. It's not important what you write. It's important that you write. That's one of the main lessons I learned in high school. In my senior year, Mr. Vellucci, my English teacher emphasized the importance of writing. The best way to get past writer's block and begin writing, was just to begin writing. About what did not matter. Just start writing and edit later. This thought also occurs in Robert Pirsig's "Zen and the Art of Motorcycle Maintenance". One of the English professor's students gets stumped in a writing class. The professor tells the student to just start writing, but the student says they can't come up with anything to write about. The professor points out the window to a brick building, and then points to an ordinary brick in the building. The professor then tells the student to write about that brick, and, when finished, to write about the brick next to it. One thing that also came out of Mr Vellucci's class (though it could have been another) was that whenever writing a paper or an essay, the first thing I should do when I begin editing was to simply delete my first paragraph. Regardless of what was in it, deleting that paragraph would be a good idea. Naturally, I was arrogant enough to think I could always write a good first paragraph, but I was wrong. Invariably, my writing was always better when I deleted the first paragraph. The first was was really nothing more than a warm up. In the later paragraphs was when I actually started communicating ideas. Today, this still comes in to play. At work I produce various proposals, training documents, and presentations. I will often get stuck, however. When I am trying to manage multiple projects and competing deadlines, it is very easy to get stuck trying to do it right and end up with nothing to show for it. The trick is take one project at a time and just start writing the content for it. The most powerful force in the universe, besides compound interest, is the power of editing. Editing gives me the freedom to not worry about doing it right in the first draft. I can produce material that is boring, poorly structured, unoriginal, ugly, confusing, or just wrong. Then I have something to work with. I can fix the problems and improve on it. Once I start on something with the expectation that I will edit it, then it doesn't matter if I get it right at first. However, once I start on this process, without the pressure of trying to be perfect, then magic starts to happen. Ideas come to me. Words begin to flow. I am free-er to try different things and experiment. The trick is to just get started. The important thing is not what you write. The important thing is that you write. I've flown through well over 40 airports in the past 6 years. Today however, was the first and only time I've flown through ATL -- Atlanta Hartsfield airport. This is really unusual for the business traveler. Approximately 95% of flights in this country arrive at or depart from Atlanta. 4% of the remaining flights are delayed at O'Hare (ORD) and the remain flights are stuck on the tarmac waiting for a gate at JFK. But today, I finally flew through ATL. This airport is the busiest in the country and has achieved mythic status in the lore of the business traveler. It supposed to be the biggest, busiest, best, and most annoying airport in the country. Now that I've been there, I can say without a doubt that they need to clean their carpets. Really. They're dingy and sort of faded gray-beige. Really, airport authority, call someone. They'll come out and do it for you. And by the way, there are no mermaids in the Atlanta airport. Yes, I have a BA from Yale, an MA from Harvard, and a PhD from Oxoford. I'd be happy to make your frys. It may soon be illegal to lie on a resume about degrees. It seems the Washington legislature is about to make it against the law for people to claim to have a degree the don't have, or to claim a degree from an unaccredited University without disclosing that it is unaccredited. I'm torn about this. Naturally, it is not a good idea to falsify a degree. If someone finds out, it can be career suicide. People have been fired years down the road for lying during the application process. But do we really need legislation that addresses this issue? Is it so wide spread that the state needs to be fining people? Perhaps there is a middle ground. While I'm not sure the state should be fining people over this, it is clearly fraudulent. Employers who hire people, and then learn they falsified the credential should probably sue for fraud. I supposed if someone claimed to graduate from an institution, when in fact they didn't, perhaps the school can sue for libel. If we are going to put legal restrictions on employees requiring them to represent themselves accurately, should similar requirements be placed on employers? Should they be allowed to change the nature of the job after offering it to the employee? If not, how long should they be required to maintain the original position? If folks are simply honest in the interview and application process, we can see better employment matches all around. As Jon and I were discussing the future of Play Cole today, it occurred to me that it is much easier to be supportive of friends in comedy than in music. I imagine this applies to theater and similar activities as well. Music can be a more polarizing element for people. Or rather a sharply distinctful one. The continuing decline of Top 40 radios is emblematic of that. Popular music has divided into several rigid genres, each with its own audience. And beyond the world of popular music, the other genres (country, classical, jazz, soft jazz, world, angry, etc.) each have their own very specific fan bases. While many people my follow more than one genre, they are not likely to be fans of all of it. The point is that even when someone is good at making music, that music will not be liked by a large number of people; those outside the genre simply won't enjoy it. They may be appreciate the technical proficiency a performer brings to a task, but appreciating technical proficieny is not what want to do after a long day at work. Thus, when people tell me they are in a band. I think that's great. I may be interested in seeing a performance, but that doesn't necesarily mean I will like what I see, or that it is, in my view, entertaining. Comedy is different, however. It is easier to go see. And when someone is technically proficient at comedy, it's going to be funny, pretty much by definition. Thus, when seeking entertainment, comedy is more likely to deliver than an associate's music. So where does theater fall in? Some where in between I imagine. But I'm not going to explore that today. Appreciating comedy has a lower barrier of entry. It's also easier to laugh. Plus, people tend to get angry when you laugh at their music. "...I've signed legislation that will outlaw Russia forever." I love it when Presidents forget they're MIC'ed. "'I want to share some thoughts with you before I answer your questions,' Bush began. 'First of all, I expect this conversation we're about to have to stay in the room. I know that's impossible in Washington.'" Probably the least contraversial thing the President said this week. Is anyone else watching this show? I haven't checking the ratings lately, but somehow I have caugh 3 episodes on live TV so far. It stars Tom Cavanagh, perhaps best know for his starring roll in "Ed", another quirky TV show that seemed to develop a strong cult following, although somehow I never caught it. In "Love Monkey" Cavanagh plays Tom Farrell, an A and R rep for an independent music label, charged with finding and promoting new talent. I'm not sure why I like this show, but I do. Farrell's internal monologue drives the show and nearly the whole show is told form his perspective. There are bits where we learn more about his friends out side of his perspective underneath his internal monologue. It's touching without being too syrup-ey. It covers the tension around growing up (as an adult). It also explores the necessary tension between music as art, music as business, and music as obsession. Overall, it seems to strike a nice, gentle, and interesting chord while not going overboard on the sappy or sweet. Well, I had this post ready to go. Then I heard the show might be cancelled after just 4 well done episodes. Posters on several forums claim the show is cancelled. I have not been able to verify that, however. This is a show that has legs. It's got compelling, likable carries, and it should be allowed to survey. More and more often, however, the networks aren't giving these shows a chance. Jon discussed this a couple weeks back, too. It's frustrating because so many good shows over the years would never have survived in today's environment. Shows like Star Trek, Seinfeld, Cheers, Cagney and Lacey are just a few that come to mind. If given time good story telling makes for good TV. Instead of more episodes of this refreshing series, we are likely to get reruns of NCIS, which is not a bad show, but it's not the same. I've been voting as a permanent absentee for several years now. I rarely miss an election. When I registered to vote in King County several years ago, I opted to have a ballot mailed to me in advance of each election, rather than trying to get to the polls. King County encourages this. There is no requirement that a voter actually be absent on election day; they simply offer the option. In fact, during the 2004-11 election, 70% of ballots cast were absentee. But now they are expanding the program. While voters can vote in person if they want, that should be a small number of people. It should make it a lot easier for the county to administer the election. After the debacle of the WA governor's race in 2004, they need to do something. This way they don't need as many poll workers, and it should be easier to collect and organize ballots. While printing, postage, and new equipment may mean that the election is no cheaper, it should at least be cleaner operationally. I would like to think this will increase voter turn out, as well. If voters don't even need to leave the couch to vote, they can't argue that it's too much trouble. Fill out the circles and drop the thing in the mail with your power bill. It can't get much simpler. I have little patience for eligible voters who don't vote but then complain about the results. Voting a blank ballot or one with a write in candidate is much more credible if someone can't stand any of the options. Now there are even fewer excuses to shirk this most basic responsibility. driving with her infant son on her lap rather than in his car seat. " Sigh. I don't know where to start. Well, the X17 photography agency apparently owns pictures of Britney Spears driving with her relatively new infant on her lap. Between her and the steering wheel. No car seat. I'll let the stupidity of that settle for a moment. Ok. Britney claims she did it to get away from paparazzi that were stalking her. The photo agency claims the pictures were taken in a peaceful manner, and that they speak for themselves. Whatever. I'm in SoCal today. There is a significant brush fire that I can see from my hotel room. It has closed a local highway. Since it's the nature of the freeways here, I'm sure there were some major wrecks today somewhere in LA area. This morning was a major memorial for Coretta Scott King. Also, stuff happened throughout the state of CA today. There must have been news in LA besides this. But KCBS chose the Britney story as the lead. They teased it and then began the newscast with it. They felt this was the most important story of the day. They looked at the pictures. The talked to her neighbors. They included some shots of the SBUX Britney was leaving. They showed a police car leaving Britney's Malibu estate after investigating complaints resulting from the pictures. They talked to an "expert" who explained that unrestrained children can become missiles in even a low speed collisions. To wrap up the segment, they found an SUV and the reporter sat in the driver's seat. They shot the scene from the passenger door. The reporter explained the images again, that Britney had the baby on her lap between her and the (bang it for effect) hard steering wheel. The she looked into the camera. For the big wrap up. That if police can prove the SUV was moving at the time, Britney can be cited.. This was the most important story in CA today according to the local news. BlogThis! Cromely's World. Friday, December 23, 2005. Cromely @ 11:17 PM 0 comments. About Me. Name:Cromely. Cached - Similar pages "
Exciting news. As of today, this blog now comes up as hits number 1 and 2 on a Google search for "cromely". Thanks to everyone who has read (or at least skimmed) these ramblings, and to all who have linked here. Of course I love the music of Bono, Paul McCartney, and the Rolling Stones. There are few performers today who can even come close. Be are we totally bereft of domestic talent? The Superbowl is the most American of all holidays. What other nation can so deftly combine violence, gluttony, and excessive consumerism in one afternoon? Throw in the random sexuality and juvenile humor in the commercials and you really have something that the USA can be proud of. Europe can't even come close with it's little World Cup. But the Superbowl was in Detroit this year, and in order to find good musical talent in the home of Motown, we had to go to the UK? To the Rolling Stones? I have nothing against the Stones, but come on. Why didn't we take this opportunity to celebrate everything Motown has given the country? This music changed the face of American Pop more than the Stones ever could. And Motown is relegated to pregame opening act? That's ridiculous. So once we get to the halftime show, the one people might actually watch, what do the Stones give us first? The Microsoft song. Then another one. And then they wrap up with a song that was just covered by Britney Spears. Last year's show was Paul McCartney. Granted, the previous Americans to do the Superbowl (Janet Jackson, Justin Timberlake, Kid Rock, P Diddy, and Nelly) didn't exactly do us proud. They created her own ridiculousness with the event that graced our language with the term "wardrobe malfunction". I'm sorry, but I don't buy the "malfunction" part. Why wear jewelry like that if you don't expect people to see it. But is a Knight for the British empire really the best choice to make up for that? I began wondering about this trend during the 2002 Superbowl. The one where in half time, they chose to memorialize the victims of 9-11. It was a well done show, appropriate and touching, but for the patriotic celebration, where did they go? To an citizen of Ireland. Now, I am a U2 fan, and Bono has done some incredible things and made some utterly amazing music. And my own Irish blood jumps with his success. But isn't there a disconnect here? Is it so hard to find talented US citizens to perform? Or at least people who are pursuing US citizenship? The Seattle Times Home Page: "
Steelers take advantage of penalties and interceptions to win the franchise's fifth NFL championship." Well the Steelers played good ball. Props to them for that. The Seahawks played good ball, too, however. They seemed to make some big mistakes in the the last minute of each half, unfortunately. Okay, so someone may need to review the basics of holding with the Seahawks, because they had a number of silly penalties early on. The Seahawks made a number of mistakes with penalties, but this game really hinged on a few yellow handkerchiefs. One was the offensive pass interference call against the Seahawks that cost them a touch down. That one was taken away when the receiver shoved a defender out of the way. But the call that gave the Steelers their first touchdown was bogus. They never crossed the goal before being down. The refs ruled the other way, however, and chose not to overturn it on replay. Bogus call. The other call was the one where Matt Hasselback was called for blocking below the waist after the late game interception. That call handed Pittsburgh and extra 10 yards and was bogus. It's not a block when your trying to tackle some one. A couple of bad calls combined with a few reasonable ones really cost the Seahawks. The Steeler defense played well. The offense didn't really make a lot happen. They scored often on accident, not really moving the ball or playing solid offense. The benefited from a couple Seahawks errors and some generous officiating. But there's always next year. Within the next 12 months, we should see the Seahawks win Superbowl XLI, the Yankees win the next world series, and the Carroll College Fighting Saints win the Rose Bowl. The Mandalay Bay hotel in Las Vegas, NV, seems to have gone down hill in recent years. The casino and restaurants are still very nice, but the hotel itself seems to be having problems. I've stayed there every year since 1999. It used to be a great hotel. The rooms were large, and the marble bathrooms were a nice touch. The colors were bright and vivid, without being obnoxious. It was designed with a faux south pacific look and feel. It's kind of a tropical no place that just seemed relaxing. The rooms were well cleaned and well maintained. And it had the kind of bedding that just sucked all the energy right out of you, cleaned it up, and then put it back in you the following morning. In the past few years, however, it seems to have declined. The rooms are still big and the bathrooms are still marble, but the details are no longer there. The bedding is no longer high-quality. It's okay -- roughly equivalent to a Hampton Inn. The carpets in the rooms are clean enough. The carpets in the hallway, however, look like they haven't had a deep cleaning in years. The bright and cheery colors have turned drab and gray. Other details are missing, too. In my room the broadband connection was loose. The picture quality on the TV wasn't great. There were no drinking glasses my first night. And it takes literally 5 minutes to get hot water running in the shower. My co-workers reported similar issues in their rooms and some of them even reported cleanliness issues. I know this sounds whiny, and maybe it is. I know these aren't major problems; in another hotel I might not even notice them. At least I wouldn't be annoyed by them. But this is the Mandalay Bay. And I remember when it wasn't like this. It used to be a lot nicer. There was greater attention to detail. At more than $230 a night, I expect better. There are probably a couple reasons for the decline. A couple years ago, they opened an expansion called “THEhotel.” It's an all suite tower with a separate entrance. It is promoted as being a chic business retreat from the normal wackiness that is Vegas. They also have a much higher staff to guest ratio. Opening up the expansion seems to have distracted management from the main property. It seems like they could stand to do some more detailed walk throughs of the different rooms and floors. And then fix the problems. The other reason may have something to do with the merger. Last year, MGM Mirage purchased the Mandalay Resort Group. It could be that they do not want to do any major work until that process is completed. Again, there could be a distraction issue here, too, but it could also be a question of not wanting to spend any money. Regardless of the reasoning, the Mandalay Bay management can do better. They have in the past, and of since they are marketing themselves as a high quality resort, they should do so in the future. Phoenix Sky Harbor International Airport: Rental Car Center: "Phoenix Sky Harbor International Airport: Rental Car Center"
I just got back from PHX today. The recently opened a new rental car center at the airport. Okay, "at the airport" may be a little generous. It's actually about a 10 minute drive form the airport. Prior to 2006-01-19, when you left the terminal, you would wait for the shuttle bus for your rental car company to take you to their off site facility. With Hertz there was never much of a wait, which was important when arriving in PHX in August and standing out in the sun to catch a bus. Now, however, you just board a generic rental car shuttle and it takes you to the new building that houses all the rental car vendors. The new building appears to be build into a hill, or have large mounds of earth around it, presumably to help with cooling. The new building and ramp complex is huge. In the main customer service center, where they have all the counters, it is at least 100 feet from the doors to the counters. That's just open space. I have no idea why they left so much space; it can't have been cheap, but it is incredibly open. When you drop off your car to return the airport, you have to catch the right shuttle because each one goes to only it's own terminal. Over all, the facility is fairly convenient, very clean, and very open. It takes a long time to get there, especially since the shuttles don't run as often as when I only had to catch the Hertz bus. This trip my rental car was a Pontiac Grand Prix. These new ones are actually pretty nice. The driver seat is comfortable, and the car has some power. It's really a surprising car. "A hopeful society has institutions of science and medicine that do not cut ethical corners, and that recognize the matchless value of every life. Tonight I ask you to pass legislation to prohibit the most egregious abuses of medical research: human cloning in all its forms, creating or implanting embryos for experiments, creating human-animal hybrids, and buying, selling, or patenting human embryos. Human life is a gift from our Creator -- and that gift should never be discarded, devalued or put up for sale. (Applause.)" "Creating human-animal hybrids"? When did this become a problem? And where was I? When I heard this clip on "The Daily Show" I thought it was just a well done audio edit, and kind of funny. But then I looked up the transcripts on www.whitehouse.gov and there it is. Granted I'm not the news junkie I was in school, but I still like to think of myself as fairly well informed, with a pretty good grasp on the much of the cloning dispute, but this is the first I've heard of animal-human hybrids becoming an issue. Has technology advanced to the point where we will soon have Centaurs at the petting zoos? How come nobody told me? Is this even an issue Congress should be handling? Isn't this more appropriate for the Ministry of Magic or the United Federation of Planets? And we've still got about 150 years before Dr. Arik Soong is born. And even if Congress is going to take up the animal-human hybrid issue is there any real congressional opposition? Is someone going to filibuster in favor of werewolves? And this was a serious mention in a speech, vetted by dozens of people, I'm sure. It wasn't just something thrown into a press briefing to satisfy some fringe interest group that donated to the campaign. Apparently, there are a lot of people who consider this a serious issue, and are actually afraid of the future onslaught of these critters. "Our laws are lacking in this area," [Sen. Pam Roach, R-Auburn] said. "People are coming from out of state to do this here. We don't need to have a mecca here for abusing animals." As early as 1995, I was railing against paper. In an early website I had, I declared war against paper documents, especially in a business. I had recently spent time working in the Microfilm industry, and digital equipment was starting to become more popular. One day, I will re-post that early thesis. But like documents, voice and sound can easily be turned into 1s and 0s. Then they can be sent across the internet. For now, though, I am beginning an experiment. It's not earth shattering; several thousand people have apparently been doing it successfully, at least according to the commercials. I'm trying out Vonage. For those who don't know, Vonage is an internet telephone company. For years, people have been having voice conversations over Instant Messaging application and other software, bypassing the local Telcos. Vonage is different. It let's you use a regular telephone and to make and receive calls over the internet, regardless of whether the person you are calling has a traditional phone system, cell phone, or internet phone service. It appeals to me for a couple reasons. I like the portability of it. I like easily moving voicemail to the computer. It seems well designed for those who travel extensively. It also means I can have a phone number in any area code assigned to me. Plus it offers flat rate billing for long distance. The main reason I really like it though, is that I don't have it yet. I just ordered the service yesterday, and the hardware is due to arrive while I'm at the airport. It will be a couple days before I'm actually able to try setting it up. Once I do set it up, I'm sure I will be extremely frustrated with it because I won't read the directions and will think I know better than whoever developed the product. Finally, I'll follow the directions out of frustration and get it to work about 90% right. Fortunately, I'm only switching over one of my phone lines to start.